With a growing season like we are having in 2012, it is likely that residual nitrate concentrations in the soil will be high, especially if corn was harvested early as silage or if yields are well below expected. One benefit of planting cover crops after corn silage, small grain, or a processing vegetable crop, or after a manure application is that the cover crop can take up residual nitrate and reduce the risk of nitrate leaching between harvest and planting. Other benefits of cover crops include reduction in soil erosion and weed suppression. This article focuses on using cover crops for nutrient conservation benefits rather than growing cover crops for forage. For tips on growing cover crops for forage see Winnebago County Agricultural Agent Nick Schneider’s article on Emergency Forage Cover Crop Tips (http://go.wisc.edu/xvmh3a). The USDA-NRCS has announced additional funding through Environmental Quality Incentive Program (EQIP) to provide financial assistance to establish cover crops. The sign up for this program runs to August 24. It is important to note that this program does not allow for harvesting of biomass as forage (http://goo.gl/EvrQN). Another program, the Conservation Stewardship Program (CSP), has cover cropping as part of the program, but sign up was required at the beginning of the year. If deciding to grow a cover crop for forage, and mechanically harvest, you will not be eligible for some government programs and you may not be able to insure the subsequent crop. Cover crops to trap nitrate. The ideal cover crops for a nitrate trap crop are grass crops that establish quickly, such as cereal rye (aka winter rye), oat, barley, annual ryegrass (aka Italian ryegrass), and sorghum-sudangrass. These cover crops also have a fibrous root system. Brassicas (e.g. radish, turnip, mustard) and legumes (clover, hairy vetch) will also take up residual nitrate, but do not establish as quickly. Radish has been popular cover crop in no-till systems and, if planted early enough, radish can take up as much or more N compared to grass cover crops during the winter, but grass cover crops can scavenge N deeper into the soil profile. The radish will winterkill, while rye will continue to grow (and take up N) in the spring. Oats, barley, sorghum-sudangrass, and annual ryegrass will typically winterkill during Wisconsin winters. However, growers have noted that annual ryegrass can be difficult to control if it survives the winter and is not completely killed with tillage. The planting timing and seeding density of these cover crops is very important for establishment. Our recommendations for seeding rates (drilled) are 90-112 lb/ac for rye, 15-20 lb/ac for annual ryegrass, and 80-110 for oat, 60-90 lb/ac for barley, and 35-40 lb/ac for sorghum-sudangrass. Apply toward the higher end of the range with later plantings (especially after Sept. 15th), in weedy fields, or if broadcast seeded. Grass cover crops are more likely to establish during the fall months, while legumes and brassicas need to be planted in summer months to ensure a quality stand. The NRCS Wisconsin Agronomy Technical Note provides some general, statewide recommendations for seeding rate and planting time for cover crop species (http://goo.gl/hXxMO). Legume cover crops (i.e. green manure crops) will also take up residual N; high residual nitrate environments will cause nodulation to be delayed. However, if the goal is to trap N or grow a cover crop to provide soil conservation benefits, we would not recommend planting legumes. If the goal is to supply N to the subsequent crop, then legumes would be recommended. The N contribution from a green manure crop is called “nitrogen credits”. This N credit means that when you terminate the legume prior to planting, you can reduce your N fertilizer by the value of the credit. The total amount of N in the biomass will be greater than the “credit”, as not all of this organic N will be mineralized for the subsequent crop. The credit is based on field research, comparing optimum N rates when using green manures to optimum N rates when not using green manures. Late plantings of legumes are not ideal, as at least 6” of growth is needed to produce a predictable N credit. Do we get the “trapped” N back? The N taken up by a cover crop is cycled back into the soil during the decomposition of the plant biomass. The release of N into the soil is, in-part, a function of the carbon to nitrogen (C:N) ratio of the plant material. In general, the decay of plant material with a C:N ratio between 20 to 30 results in no net contribution to, nor consumption of, plant available N. Plant material with a C:N ratio less than 20 can result in a net excess of N after microbial decomposition. As the microbes breakdown the material, N is produced in excess of what the microbes need to function, and thus, this N is available for plant uptake. As a result, the termination of a cover crop like red clover, which typically has a C:N ratio of 15, is equivalent to an application of 40 to 80 lb/ac of N fertilizer depending on plant height (Fig. 1). However, grasses and brassicas have a C:N ratio of 20 or greater, resulting in no net effect to available N. If the C:N ratio of the plant material is greater than 30:1, net immobilization can occur, meaning that N from the soil is consumed (i.e. immobilized) by microbes during the decomposition process, resulting in a decrease in plant available N. Grasses tend to increase in C:N ratio as they grow. For this reason, we recommend killing rye cover crops as early as possible in the spring to minimize any effect of immobilization. The low C:N ratio materials (e.g. red clover) also breakdown much more rapidly compared to grasses and brassicas. This results in greater synchrony of N release with periods of high N uptake by the corn crop. 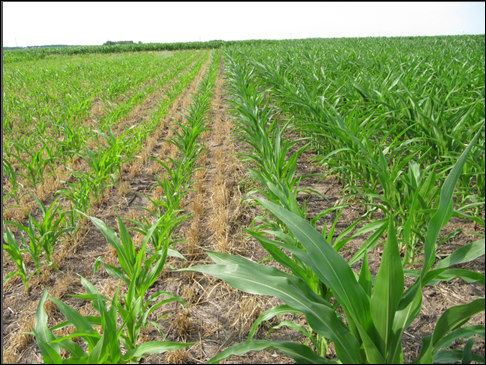 Release of N from the grass crops does occur, but often occurs later in the growing season, after peak N uptake rate for corn has occurred. Thus, we do not recommend taking an N credit for grass cover crops. However, the slow breakdown of grass crops, along with their higher C:N ratio, can lead to a greater contribution of organic material to the soil, which can increase the soil organic carbon and soil organic nitrogen content over time. The extensive root system also can lead to an increase in soil organic carbon in the subsurface soil, which can be beneficial for fertility and water retention. These types of soil building benefits will not be realized after only one year of cover cropping, but instead, is a long term effect of using cover crops as part of the cropping system. There are tremendous benefits to water quality with growing a cover crop after manure application in the late summer or fall. It has been clearly shown that fall cover crops reduce nitrate leaching losses, especially on tile drained land (http://www.agry.purdue.edu/drainage/AY-04-01.pdf). While this trapped N will not likely become plant available the following year, as previously mentioned, there are other long-term benefits of trapping the manure nitrate in plant biomass and incorporating this biomass into the soil. If concerned about the amount of time required for application of both manure and cover crops, slurry seeding of cover crops has been shown to be a viable method (http://www.mccc.msu.edu/slurryseeding.html). The slurry seeding method creates a one-pass system where cover crop seeds are tank mixed with the manure. If interested, check out the link, especially the YouTube® videos. Figure 1. 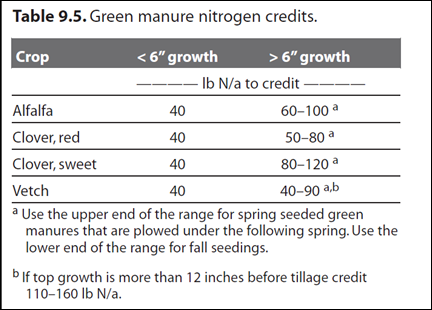 Green manure nitrogen credits for commonly used legumes in Wisconsin (Table 9.5 in A2809). There is also little, if any, Wisconsin based data to support taking an N credit following radish. We do know that radish can take up a lot of N, but are less certain how available that N becomes the following year. Current research trials in Sheboygan, Washington, Rock, and Jefferson counties are being conducted to evaluate if the benefits of growing radish in Wisconsin. What about water use? Another reason to kill the rye as early as possible in the spring is to minimize water uptake. In a year like 2012, severe yield losses on corn are expected on fields where rye was harvested as a forage crop in May (following a previous crop of corn silage). The deep, fibrous root system consumed too much subsurface water and with the drought conditions, this subsurface water was not replenished, thus creating a worse-case scenario for this type of double forage-cropping system (e.g. Fig. 2). Figure 2. Corn field in Columbia County where rye was grown for forage and harvested May 10th (left) compared to a corn field where rye was not grown (right). Corn was planted on the same date. Picture taken on June 29, 2012. If interested in scavenging excess N, plant rye, oats, or ryegrass to get quick establishment and soil coverage. Of these three crops, only rye will survive the winter. Make sure you kill the rye as early as you can in the spring. If interested in supplying N, grow a legume. An option that would be recommended through August 15th is planting berseem clover with a companion crop of oats. The oats will establish first and take up some of the excess N in the root zone, and if planted early enough, the berseem clover will establish nicely, outgrow the oats, and provide an N credit for the following crop. Oats/berseem can be planted in August, but good growth will depend on adequate moisture. A recommended seeding rate would be 8 to 10 lb/ac for berseem clover and 40 to 55 lb/ac for oats. Both the oats and berseem clover will winterkill. If interested in experimenting, try radish or a combination of radish and winter pea. This will have the greatest benefit on no-till land. The addition of a legume to the mix increases the potential for an N credit, but, it should be noted that there is no data to indicate what an N credit would be from this cover crop mixture.